"Soft By Nature, Inc. is a small family owned company nestled in the picturesque Hudson Valley region of Southern New York State. Our mission is straight-forward; we intend to pass down this earth to our children in the same beautiful condition that we received it from our parents. We accomplish this by developing all natural eco friendly products and sharing them with our fellow citizens. 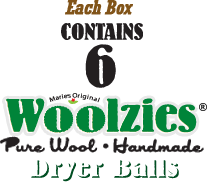 So smile when you purchase a set of WOOLZIES®, because you know you're helping to make the world a more pleasant place for yourself, your family and future generations!"